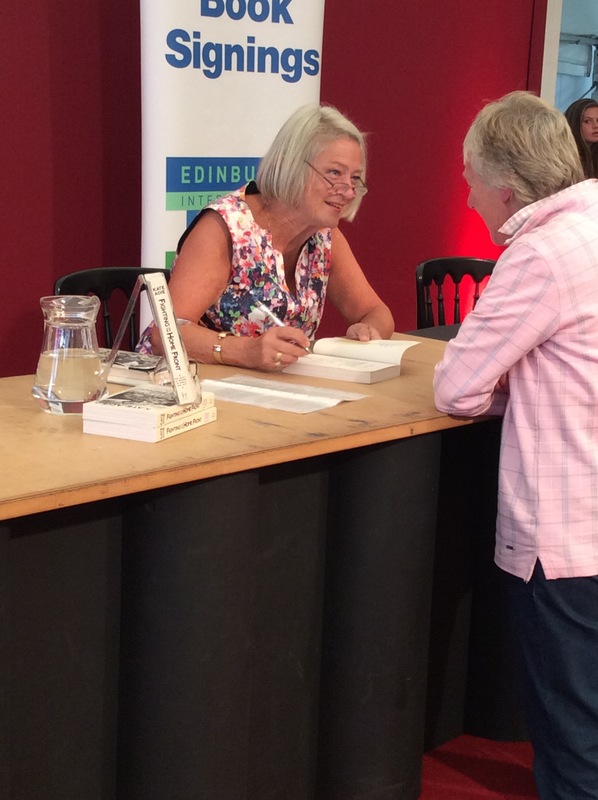 It was a very relaxed Kate Adie who addressed an expectant book festival crowd on Wed 21st August. 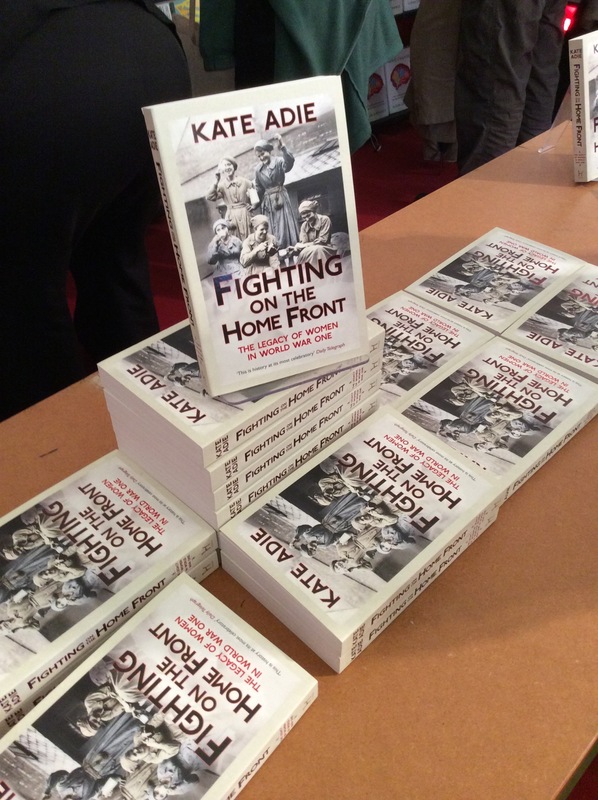 Kate was there to promote her latest, and very different book ‘Fighting on the Home Front: The Legacy of Women in World War One’, examining what life was really like for women during WW1 and the impact of women’s work on the home front. 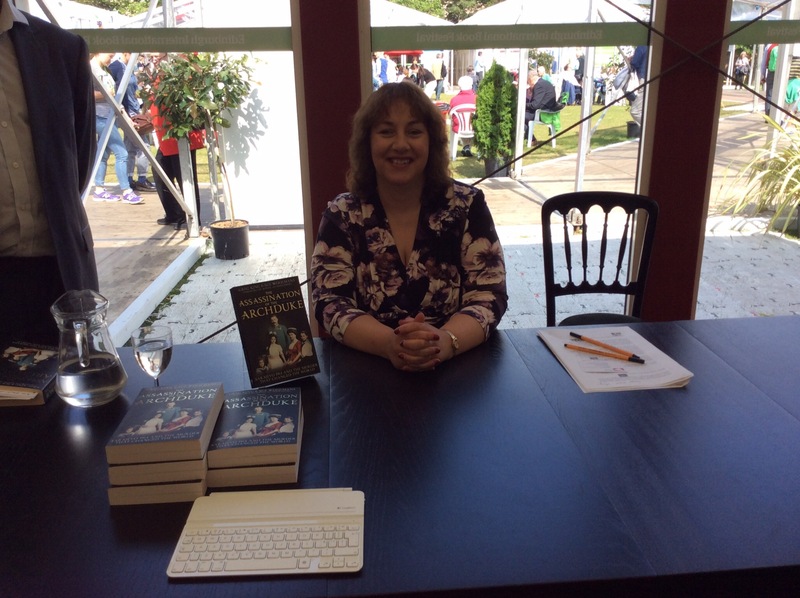 She aims through her book to chart the neglected ‘heroines’ of the time as very little has been written to date on civilian British women and the effects that the war had on them and indeed they had on the war. A distinguished war reporter familiar with the trenches of Sarajevo, and not the Somme, Kate recounts how women are often the ones keeping everything together at home by focusing on the normalities and banalities of life. Kate delivers witty anecdotes about her war time experiences and draws parallels with the women who are the key focus of her book. Interesting comparisons are made with the aristocratic women of Downtown Abbey who were a small percentage of wartime women and instead Kate focuses on the lives of working class women. What adds depth to the story is the backdrop of the rise of those ‘Horrible Suffragettes’ as Queen Mary calls them, powerful women such as Emily Pankhurst and Elsie Inglis. Women were patronised and not given the same opportunities to progress and were considered to be inferior. This view is compounded by the attitude of the medical profession who recount tales of how women have smaller brains which will overheat if given too much information! 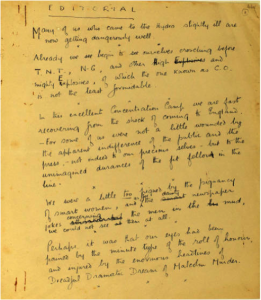 However, Kate recounts how the war helped to emancipate women and give a vehicle to the women’s protest movement as women were thrust into the limelight and into previously unheard ‘male positions’. Prior to the war prostitution had a been a major problem amongst working class women living on the edge with no opportunities for working and bettering themselves and evoking a moral panic. Innovations included the first women’s Police force, farming the land and working in the ambulance service. Kate presents interesting stories of women taking on courageous roles, no longer seen to be invisible. She tells the story of Flora Sandes initially a St. John’s Ambulance volunteer, who travelled to Serbia, where, in the confusion of war, she was formally enrolled in the Serbian army. She was subsequently promoted to the rank of Sergeant major, and, after the war, to Captain and was the only British woman to officially serve as a soldier in WW1. With work however came freedom as women were encouraged to move away from home to work, living together in hostels. She tells stories of women in Glasgow meeting in local places, engaging in shopping activity and even playing football (25,000 people came to watch a charity womens football match in St James Park). There was still however a rigid class system in place with most of the physical and demanding jobs being done by working class women and most women encouraged to work in the munitions factories earning half the wages of men. Middle class women tended to work in charity fundraising and voluntary organisations such as the WAAC. Thus a very different picture of war time Britain and the role of women emerges instead of proving what women should do the war played a key role in proving what women could do. Kate finally argues that what really mattered is whether these changes were ‘long lasting’ or just for war time. This entry was posted in World War One on 31 August 2014 by janealiknight. As the Edinburgh International Book Festival drew to a close for 2014, one of the highlights of Edinburgh Napier’s involvement took place on a sunny Sunday evening. Having heard mention of the Craiglockhart War Hospital, Siegfried Sassoon and Wilfred Owen in various talks during the Festival, it was fitting that the Edinburgh Napier University sponsored event brought these themes to the fore. 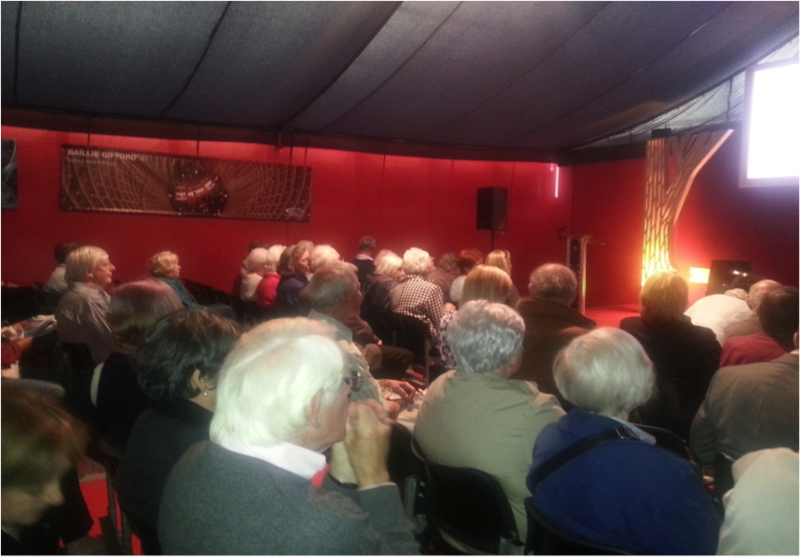 A packed audience gathered to hear about life at the hospital, the treatments and practices of the institution and the artefacts and archives which remain. On the stage was Alan Burnett (author of The Story of Scotland) and, archivist at Craiglockhart, Catherine Walker. 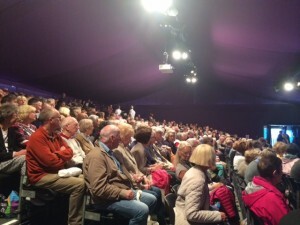 Over the course of an hour the packed audience was introduced to the history of Craiglockhart (first a hydro hotel, later a convent), the medical approaches of Dr Rivers and Dr Brock and some other connections between Edinburgh and the Great War. This latter point touched on Edinburgh-born Earl Haig, and the aerial bombardment of the Grassmarket that was news to many in the tent! 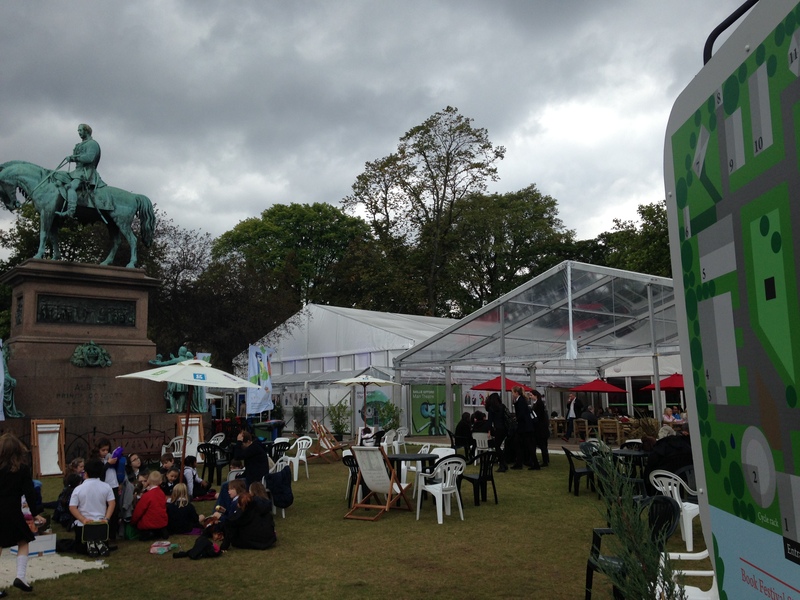 At the heart of the event were copies of Hydra, ‘The Magazine of Craiglockhart War Hospital’. Two copies of the magazine were recently brought to Craiglockhart and added to the university’s collection. Catherine W explained how the magazine was both a way to share news and a forum for discussion. Topics of the day ranged from the activities of the debating and sports societies, to the progress of women’s suffrage. There was an element of self-censorship at times, avoiding anything too controversial or revolutionary. 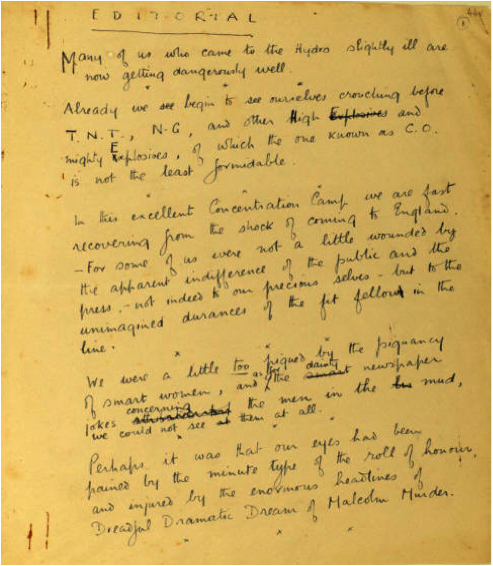 As was stated by Alan B, the commentary and poetry that found its way into these pages has ‘helped shape our image of the war’. He was keen to stress that it was written from officers’ perspectives, that Craiglockhart was a place for the select few, who were being given some of the best care available. Yet these were also men who formed part of the office class, contending with the stress of having to live up to the expectations that accompanied their role in life and the armed services. The concern for some was that they risked becoming ‘dangerously well’ and thus were flirting with being sent back to the front. 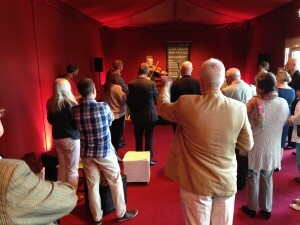 The Book Festival event was further illuminated by several readings, taken from the magazines and performed by young actors. 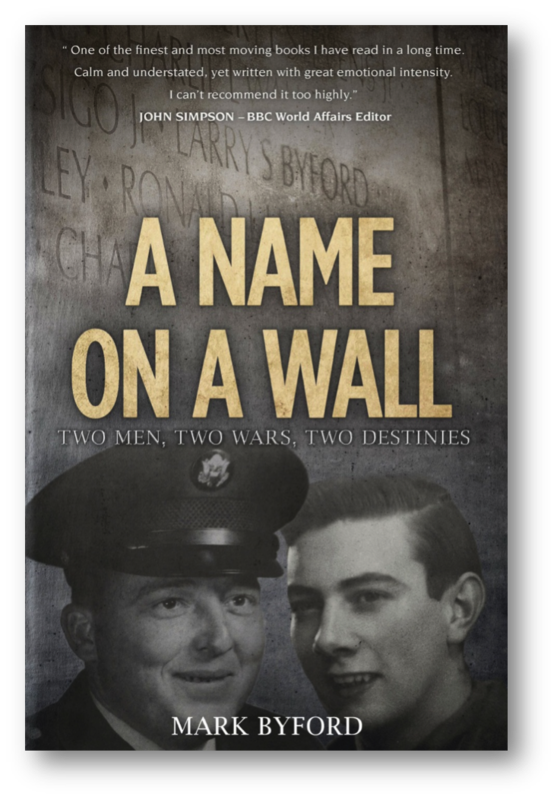 To an extent they and other such references brought home the contrast between the relatively mundanity of Edinburgh life and the experiences of war that had affected these men so. We also heard a nurse’s poem, reflecting her lived experience of growing up at this time and defying standard expectations of her place in society. 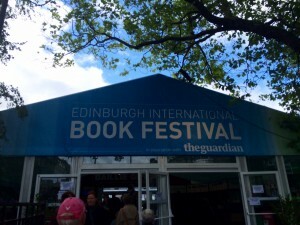 In line with many of the events to have taken place in the Book Festival’s ‘Words and War‘ this exploration of the Poetry of War was a window onto a tumultuous time for the men and women of Edinburgh, Scotland and Europe. 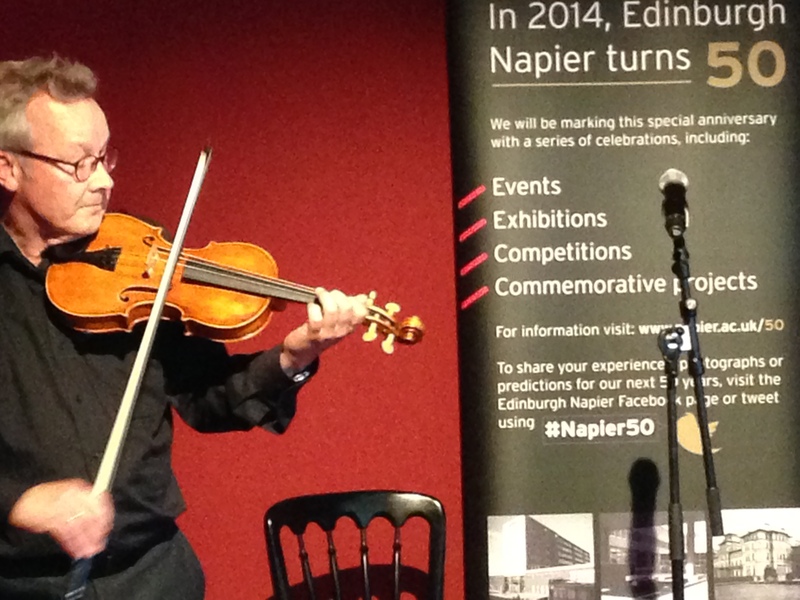 Ahead of the main event, as part of a reception hosted by the Principal of Edinburgh Napier University, a small audience was privileged to hear a few melodies played out on the ‘Wilfred Owen Violin‘. This instrument has recently been made from freshly sourced timber, a sycamore still growing in the grounds of Craiglockhart. 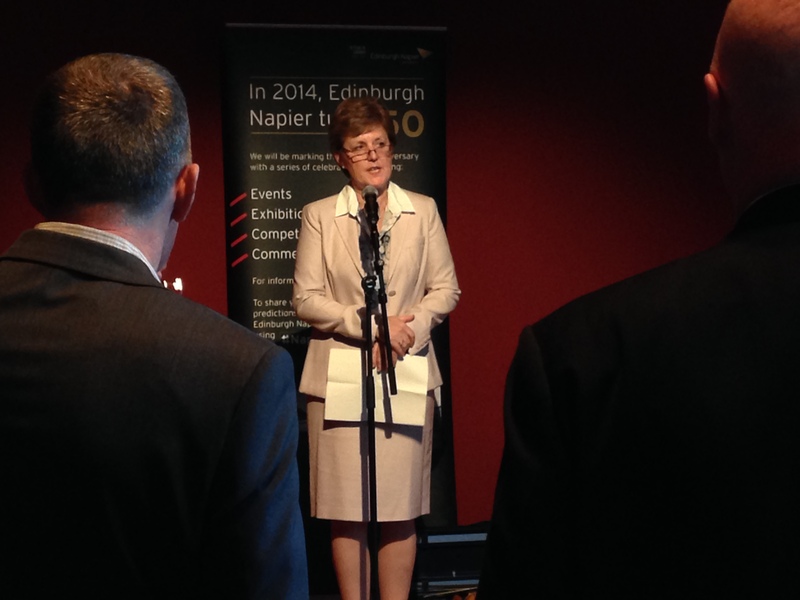 It is a unique contribution to the history of the building and our modern links to the staff and patients of the hospital, and will hopefully be heard many times again at Craiglockhart and elsewhere. 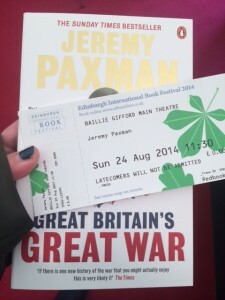 This entry was posted in Craiglockhart, Edinburgh International Book Festival, Hydra, World War One on 31 August 2014 by davidjarman. Jeremy Paxman walked into a full house on Sunday morning for the Open University event ‘War. Germany. 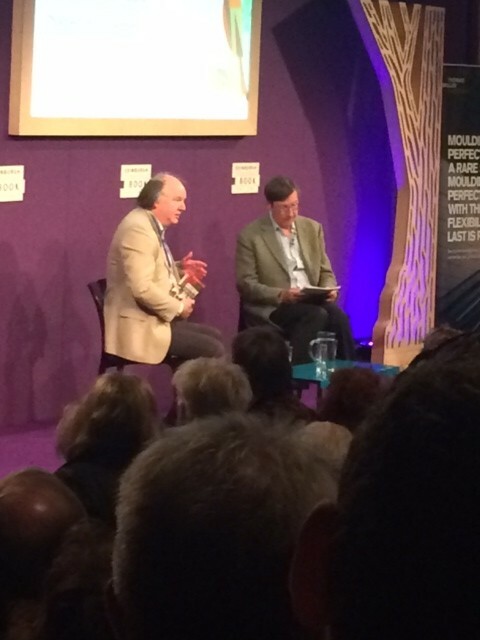 Act’ which enabled him to introduce his new book, ‘Great Britain’s Great war’. The book is based upon his recent BBC1 television documentary ‘Britain’s Great War’. Peter Gutteridge was Chairman of the event, however it was clear from the outset that Paxman was going to use the entire hour to talk and tell the stories of some incredible people during the Great War. He began his talk by stating ‘If you want to know my conclusion overall, well World War One was the event that made modern Britain’. He followed on by describing his interest in the Great War and how his ‘obsession’ had grown through the poetry of Wilfred Owen and Siegfried Sassoon. 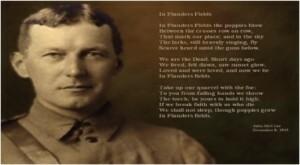 He described the loyalty of these poets to their comrades and how, although bitter in some poems, these men wanted to stay loyal to their team and their comrades within the war. Paxman described how easy it was to join the army, but how difficulty it was to leave. If a man was between the ages of 18-34 and could inflate his lungs to 34 inches, ‘he was in’. Additionally, he spoke of how you had to have ‘good teeth’ to join the army as this was ultimately a very good indicator of good health; to which many said: ‘what are we going to do – bite the Germans? !’ Which received uproar of laughter from the audience as Paxman announced this. Most soldiers within WW1 were placed in battalions with people they knew, which ultimately led to loyalty and companionship with the friends they shared their experiences with. The next photograph we were shown was of a soldier in a British trench, knee-deep in water, illustrating how bad the conditions of British trenches were. The daily drink of rum was a highlight for many in these conditions, Paxman said. The Germans were the occupying force within the war so their trenches were better. We were then shown a photograph of a young couple at their wedding, Paxman commented on ‘just how young they look’. Many men in the war tried to avoid army service, and by late 1915 volunteers were low. There was a total of 16,000 conscientious appeals in world war one, and as Paxman commented ‘contrary to common belief, they were not killed, they were jailed’. He also touched on the fact that some were shot for cowardice or desertation. 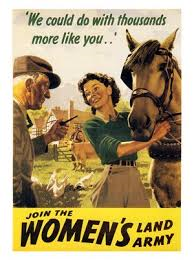 The audience was shown a photograph of the ‘Womens Land Army’: most munitions were made by women by the end of the war. Paxman then quoted ‘the hand that rocks the cradle wrecks the world’. In 1917, rationing was introduced in Britain so that the Government was able to control what the nation was eating. Paxman then focused on a photograph of two men, both of whom were amputees and both were surprisingly cheerful. 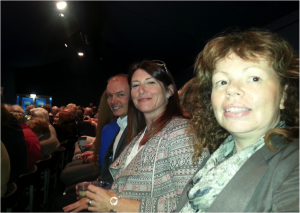 Paxman said to this photograph ‘what strikes me is the falseness in their smiles’. However, great work was done with plastic surgery within the period of WW1 and this is something that was touched upon within the talk, particularly the differences between plastic surgery then, and plastic surgery now. 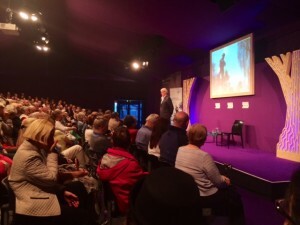 At the end of the talk, Paxman finished just as most would by remembering the men who had given their lives for the war. He spoke about the 750 thousand men who never came back to Britain from the war. He also spoke of a set of villages in England and how out of 16,000 men who left from the villages, only 40 men returned. The war changed Britain; women received the vote and generally people appreciated each other more. 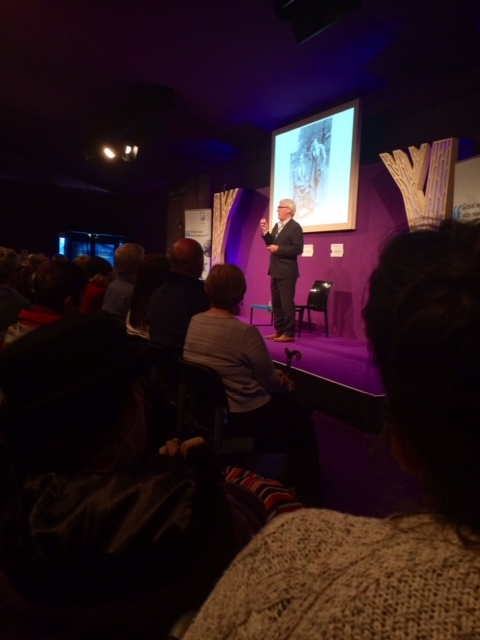 As he stated in the beginning of his talk: ‘World War One was the event that made modern Britain’. 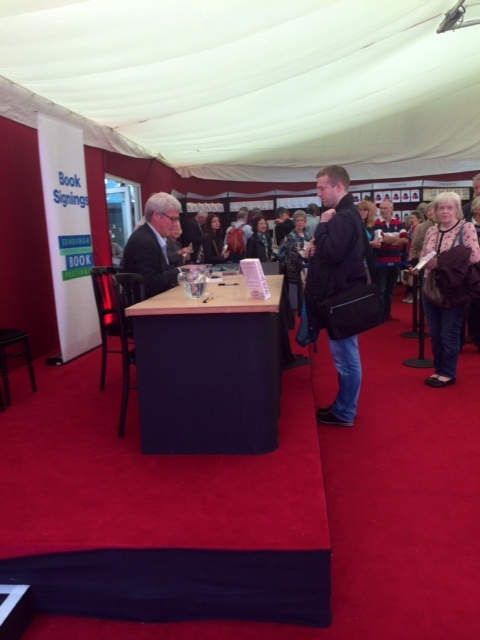 It was an insightful and genuinely interesting hour with Jeremy Paxman, not only have I loved his work for years, but I now cannot wait to read his new book. 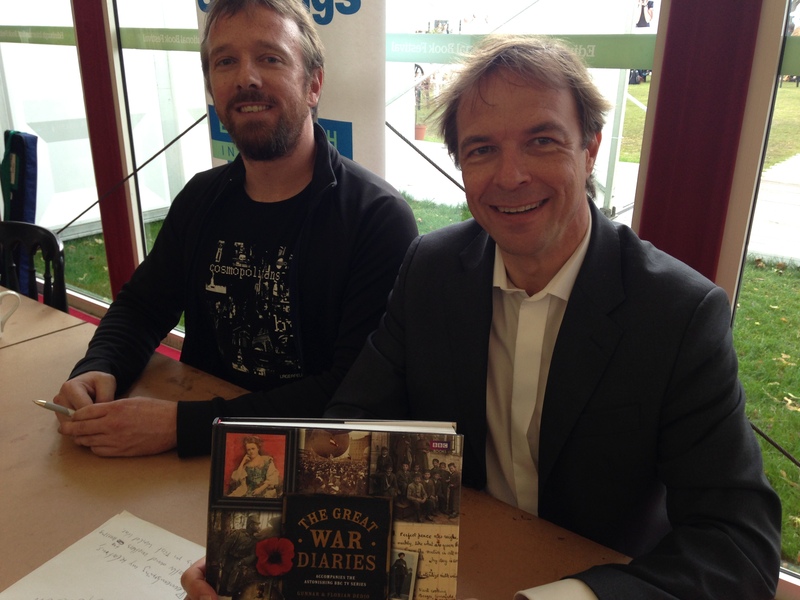 His new book ‘Great Britain’s Great War’ is available to buy now here. This entry was posted in World War One on 27 August 2014 by selinamiller. The shared connections that link a springbok called Nancy, the French town of Marseilles and warrior dancing to Scotland and the Great War (1914-1918) on first inspection may appear incongruous. 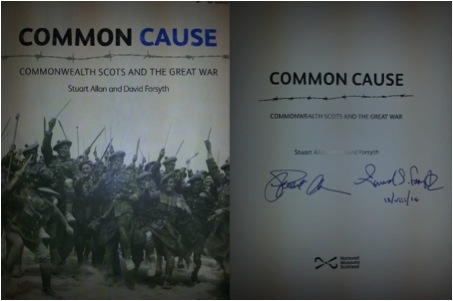 Yet Stuart Allan and David Forsyth illustrate in their new work, Common Cause: Commonwealth Scots and the Great War, how these seemingly unexpected ties are in actual fact part of a wider and deeper story of the Scots diaspora and their experiences during the First World War. 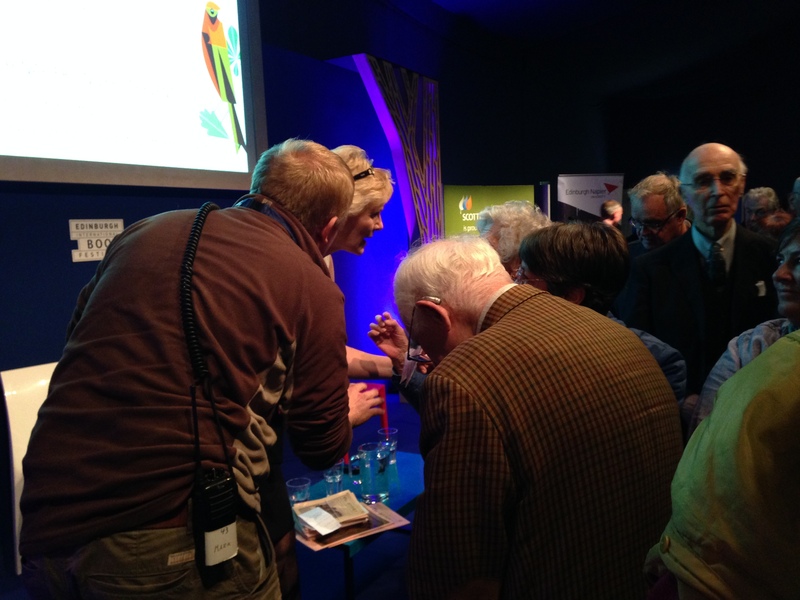 Allan and Forsyth, both senior curators at the National Museum of Scotland, joined chairperson Susan Mansfield and an eager audience in the ScottishPower Studio Theatre at the Edinburgh International Book Festival, to discuss the relevance and meaning behind their current work. The book is approached from the perspective of museum curators with emphasis placed on visual and material cultures. Identifying highly symbolic objects and artefacts, Common Cause explores the complex themes of identity, migration and conflict. Crucially, the objects lead the book and according to Allan proceed with them. With great skill and insight, the authors captured the attention of the gathered audience to demonstrate that behind a series of outwardly conventional objects the cultural background to the politics of the British Empire during this formative period could be uncovered. A case in point is the aforementioned springbok, Nancy. Nancy was gifted to the South African Scottish as the mascot for the newly raised brigade. When the 4th South African Infantry entered Marseilles, bedecked in kilts as they played the bagpipes and drums, the little springbok trotted in front of the unit as they marched into the French town. Against the odds Nancy survived to see the end of the War and after her natural death was preserved to become a relic of the brigade’s military heritage. While remarkable such a little creature could survive in hostile conditions, the real significance of this mascot lies in its symbolism. The 4th South Africa Infantry were raised by an emigrant Stirlingshire Scot, Sir William Dalrymple, a mining magnate. Dalrymple ensured that the Scottish nature of this newly formed brigade would be apparent to all who encountered them by adopting traditional Highland dress, bonnets and establishing a regimental pipe band. However, a South African identity was also made manifest through other expressions that began to intertwine with the Scottish traditions of the brigade. The springbok, native to South Africa, is a statement of South Africa identity and at this time of the imperial nation of South Africa. Moreover, the extraordinary photograph that adorns the cover of the book captures the brigade performing with gusto – in kilts and bonnets – an African warrior dance. By looking closely at the representation behind photographs, mascots and other objects the authors highlight the pluralistic identities that informed the Scots aboard that were of a cultural, national and military nature. From a material histories perspective, Common Cause pinpoints the tensions between imperial, national, regional and local identities that were emerging under the impact of the Great War within Britain and in the wider Commonwealth of nations. Against this context McCrae’s reflections can viewed as a counterpoint to the work of Siegfried Sassoon and Wilfred Owen The work of the latter two poets will be discussed this Sunday, the 24th of August, at an event organised by Edinburgh Napier University and hosted at the Edinburgh International Book Festival for those interested in war poetry and the Great War (see link: https://www.edbookfest.co.uk/the-festival/whats-on/the-poetry-of-war). 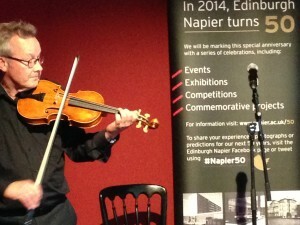 The accompanying exhibition to Common Cause: Commonwealth Scots and the Great War can be seen at the National Museum of Scotland, Edinburgh, from the 11th of July until the 12th of October 2014 (http://www.nms.ac.uk/national-museum-of-scotland/whats-on/common-cause/ ). I would sincerely recommend Common Cause, the book and the exhibition, to anyone interested in this crucial period in Scottish, British, Imperial and Global history. 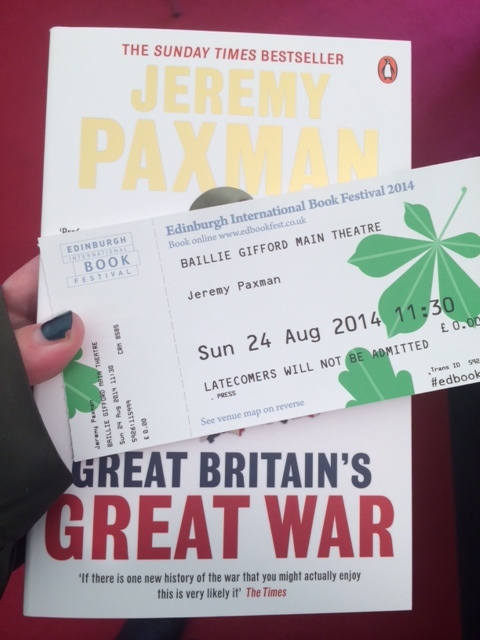 This entry was posted in Edinburgh International Book Festival, World War One on 22 August 2014 by davidjarman. Sir Max Hastings is a British journalist, editor, historian and author- most famously known for his work as a foreign correspondent for the BBC who reported from more than sixty countries and eleven wars for BBC TV’s 24 hours current affairs programme. Hastings entered the main Baillie Gifford Theatre to a full-house this morning and upon arrival received a very warm welcome. His talk and Q&A was chaired by Al Senter, an arts journalist and broadcaster. Sir Max began his talk by stating “every great historical event becomes shrouded with myths over time; 1914 is no exception”. 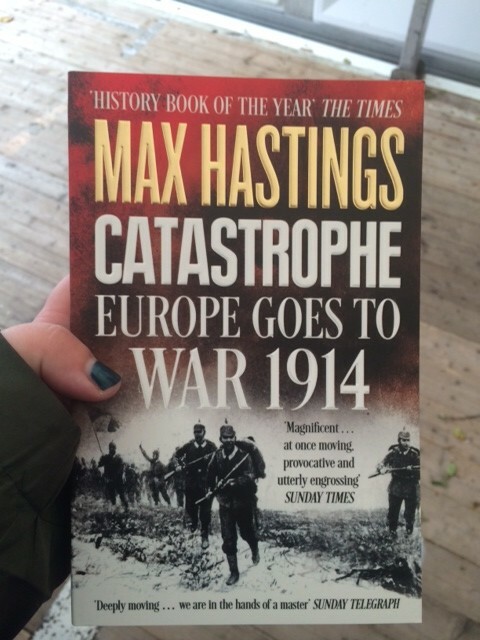 His new book ‘Catastrophe’ which has already been named ‘History book of the Year’ by The Times was the main focus of the event itself with the main question presenting itself as; what happened to Europe in 1914? 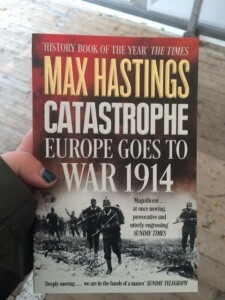 Hastings then went on to state that in the 21st century, people are still confused about the First World War, including the one aspect that war itself was a usable incident of policy at the time. His talk focused on many of the battles in World War One including the Battle of the Somme on 1st of July 1914 and the Battle of Ypres in October of 1914. 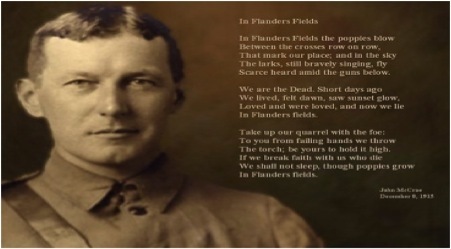 He described the Battle of Ypres as “the first true trench story of the war”. He moved on to discuss the role of women in the war and how women’s role in western society had ‘changed completely’ following the war, however as he humorously added (they) were ‘initially confined to knitting, including knitting mittens that would fit baby elephants’- which through the seriousness of the talk, brought resounding laughter from the audience. German politics at the time was touched upon and Hastings spoke of how Germany could have prevented the war in 1914 by communicating with Vienna and telling the Austrians to stop invading Serbia, however as was the case the Germans did not. He believes, as do other historians particularly in Germany, that if Germany had not gone to war, the continent would have been under German control by peaceful means, as it was a hugely advanced country at the time. He then spoke about the amount of killing that happened within the war and stated “an enormous amount of killing had to happen for one side to prevail.” It was a shock for myself and a few others in the theatre when he spoke of the sheer amount of losses that happened within Great Britain at the time. 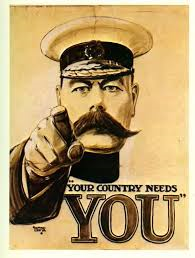 Over the course of World War One, over 700,000 British Isles men died fighting for their country. 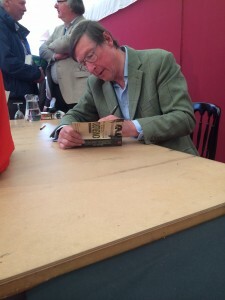 As Winston Churchill was quoted by Sir Max Hastings at the end his talk “no part of the great war compares in interest with it’s opening… moreover in the beginning our faculties of wonder, horror and excitement had not been cauterized and deadened by the furnace of years”. “Wars begin when you will, but do not end when you please” – Niccolo Machiavelli. This entry was posted in World War One on 18 August 2014 by selinamiller. Royal historian Sue Woolmans spoke to a packed book festival audience about her book ‘The Assassination of the Archduke: Sarajevo 1914 and the Murder that Changed the World’. Her opening comments highlighting that Franz Ferdinand was ‘…not a pop group’ and that her motivation for the book was ‘to rehabilitate a decent bloke’ led you to believe that an interesting hour lay ahead. Sue’s introductory session discussed how the critical part that Franz Ferdinand played in the events of the 28th June 1914, which were seen to trigger WW1, are often overlooked. This and an attempt to remedy to the world the Austrian court’s negative attitude of him were seen as key inspirations for writing the book. 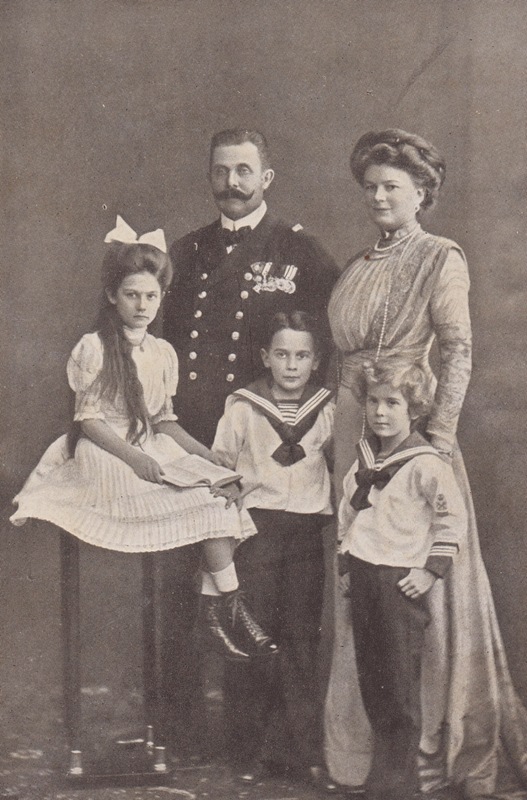 An enlightening and warming account of the young Archduke was given, revealing as normal an upbringing as possible, with a loving and supportive family. However, he was seen to be shy, withdrawn and often sickly and was overshadowed by his younger brother ‘Handsome Otto’. Sue recounted interesting anecdotes of Franz’s army career, Grand Tour and life as heir to the throne. In 1895 he suffered TB and the opportunist Otto took over duties while he was ill. To Otto’s dismay he made a full recovery and as an aside we are later told that the duplicitous Otto comes to an unsightly end with syphilis. We then divert to the fascinating and moving account of Franz’s relationship to Countess Sophie. Sue presents wonderful insights into Franz’s compassion and determination as he didn’t want to have an arranged marriage but ‘marry for love’. Even though Sophie was not seen to be his equal and everyone within the royal family was against the marriage Franz was unfailing in his love for Sophie and managed to persuade his father, Franz Joseph, to let a morganatic marriage go ahead. Described as a ‘devoted couple’ and ‘unspeakably happy’ Sophie was not allowed to take her full title instead being named Duchess of Hohenberg and, their children, Sophie, Max and Ernst would also never be heir to the throne. An idyllic domestic scene is created as the Ferdinand’s are said to have had a happy family life and Franz a loving and dutiful husband and father. Franz is shown to be a visionary thinker who fully understood that war would be catastrophic for both Austria and the region instead proposing a ‘United States of Europe’ He was seen to be outspoken holding views that were often contrary to what was expected leading him to get a bad press. Sue reveals surprising insights into the politics of the time showing that Franz was fortunate enough to have good relationships with other European leaders, particularly Kaiser Wilhelm who would visit the family and as gardening was one of his passions would discuss, not the politics of Prussia, but the roses in the Ferdinand’s family home. 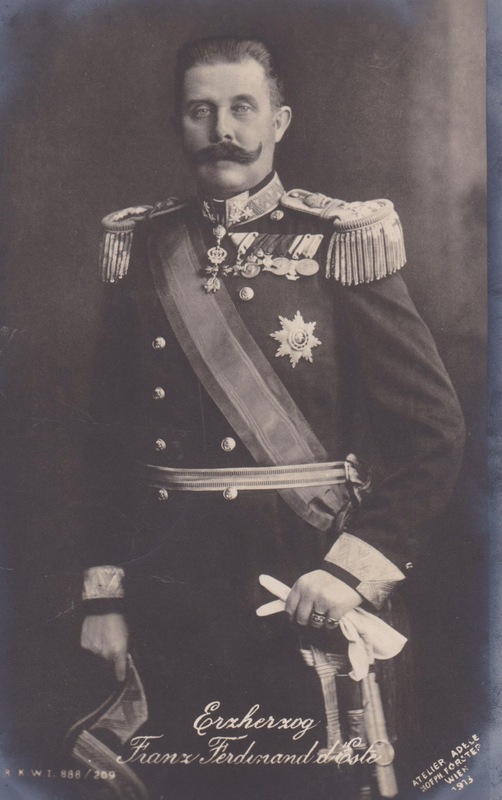 The story reaches a dramatic and fatal conclusion on Sunday 28th June 1914 as Franz and Sophie visit Sarajevo on the Serbian holiday of St Vitas day, an occasion to celebrate Serbian patriotism, to open the new premises of the state museum. Seen by many as a dangerous undertaking especially as waiting in the wings was Gavrilo Princip, a member of the Black Hand terrorist group who saw Franz Ferdinand blocking independence and vowed to assassinate him. Sue compassionately recounts the tragic story of the couple’s death and the even more tragic reaction from the Viennese people who appear unmoved by what has happened, the Emperor even stating that it was ‘one less worry’ for him and even the funeral was turned into a massive snub. Sue presents what could be a modern day soap opera – the scandals, backbiting and injustice whilst portraying Franz and his family as wholly realistic and likeable people. This entry was posted in World War One on 16 August 2014 by janealiknight. 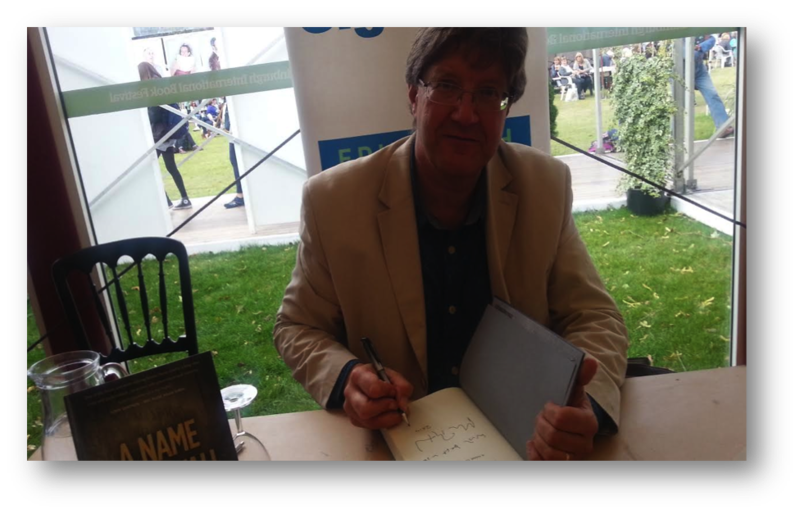 Monuments to the Great War Dead discusses the topic in historian David Crane’s book, Empires of the Dead, a history of the memorials and war graves set up in the aftermath of WWI to honour the nation’s dead and a biography of the man who enabled and oversaw the project; Fabian Ware. 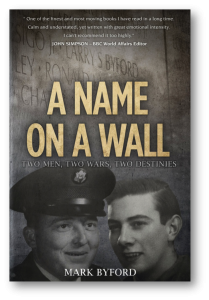 Crane brings a great amount of character, humour and sympathy in his portrayal of Ware, setting up his professional development and exploring the reasoning behind what led him to undertake the huge and impressive project of creating lasting memorials to the dead. Prior to the First World War there was no provision for burying the war dead and most soldiers, due to practical and health concerns, were buried or burned in mass graves, while those from wealthier backgrounds were sent home to be buried by their families. Crane therefore sets the development of these communal graves within the context of shifts towards a more socialist society which began during, and were influenced and spurred on by, WWI. Through Ware’s efforts, and against a lot of pressure from members of the upper class establishment back home, the war fallen were buried together and equally, regardless of rank, class, race or religion. We can see here a form of social equality which was previously unheard of and which would not take full effect for decades later, but which was adopted by a nation in mourning as a means of quantifying and coming to terms with the massive loss it had suffered. The cemeteries which were built all over the world where British, and other Empire nations, had seen action also ushered in a new way in which people paid homage to the war dead and Crane makes an effective case for this becoming an important symbol of British identity, a homage to sacrifice which transcended the other boundaries which existed within Britain and among its allies. 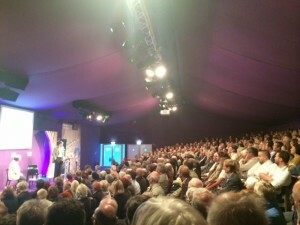 This was a fascinating talk which combined a genuine wish on Crane’s part to allow Fabian Ware to take his rightful place in the Britain’s conscious history with a precise and academic knowledge and appreciation of the time period and events to show how the British nation turned the brutality and the tragedy of war into a lasting legacy to humanism and compassion. While the First World War was not to be ‘the war to end all wars’ as a mourning nation hoped, it did start a precedent of shared grief and national unity through the reflection of war’s tolls. This entry was posted in World War One on 16 August 2014 by rorytelfer.